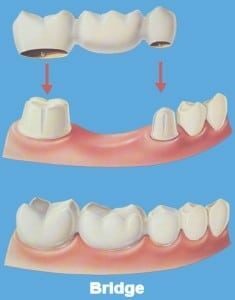 One method of permanently replacing missing teeth is with the general dentistry practice known as a dental bridge or in dentistry terms a fixed bridge. This a general dental procedure that is similar to a dental crown in that it takes multiple dental appointments (usually 2) as the teeth need to be prepared or shaved during the 1st appointment. A dental bridge does exactly what its name means: it “bridges” the space left by a missing tooth or teeth.